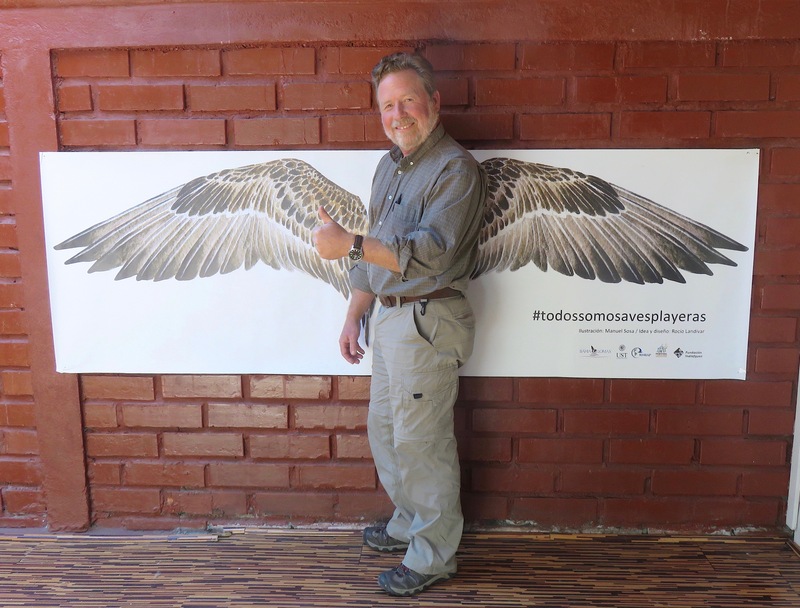 Only when one flies in a Triple Seven from North America to South America does one fully appreciate what our long-distance migrants accomplish with only the force of their small wings and perhaps a favorable wind. Every fall they fly south nearly halfway across the hemisphere, where the Austral spring awaits their arrival. I too flew south to Santiago, Chile to begin a month’s journey accompanied by ICFC Shorebird Projects Coordinator, Patricia Gonzales. The mission was simple: this was an opportunity for us to greet and thank our many project staff for all the wonderful work they do every day to secure the southern homes of our migratory shorebirds and their resident waterbirds and to see firsthand the results of our combined efforts. Getting there was half the battle as then began our journey by planes, buses, and taxis to cover 5,000 kilometers in 28 days to see firsthand the places protected by our partners. After a 4-hour layover in Santiago, with an efficiently scheduled lunch with Diego Luna Quevedo of Manomet Center for Conservation Sciences, I continued on to Puerto Montt, where I was welcomed by Claudio Delgado of Conservacion Marina and his colleagues. We toured the recently established Maullin Coastal Wetlands that support thousands of Hudsonian Godwits and the gorgeous, green Chiloe Island with thousands more shorebirds. To illustrate the profound surprises one encounters on such journeys, I was introduced to the owner of one wetland, only to learn we shared the same surname, Hecker, and therefore wondered if we could have ancestors in common. Next, south to the end of the earth, Tierra del Fuego, where Magellan and Darwin made historical journeys, all the way to Isla Grande, which is the final destination and wintering home for the majority of North America’s endangered Red Knots (rufa). Here I reflected again about what it must be like to fly 15,000 kilometers and how important it is to arrive finally at a safe refuge in which to rest and replenish. Here we were greeted by more dedicated researchers, reserve guardians, educators, birding guides, photographers, and penguins, who seemed human enough to add to this list. From Ushuaia, you can only go south to Antarctica or head back north. We reversed our direction, but this time on the Atlantic side of Patagonia, visiting Rio Grande with its extensive Coastal Reserves and Rio Gallegos with it huge tidal estuary. Germán Montero and our guardians from Asociación Ambiente Sur showed us a mobile ranger hut that they made from a shipping container, and a sea-side shorebird interpretive center that was simply second to none, in my 35-year career. Patricia had carefully planned for the full use of every moment of this journey, taking advantage of the longest days of the year in the austral summer. By 6AM we were off to catch the outgoing tide at San Sebastian Bay, a flat treeless place with miles of mudflats, roaming guanacos (relative of llama), and winds that whisk your hat out of sight from zero to sixty. At the end of this day I was served the national (and nearly sacred) hot drink, mate. In shocked horror and then laughter my hosts told me that one does not stir mate! Our final days were spent in the familiar home region of Patricia, San Antonio Oeste, where we support the work of Fundación Inalafquen. Again, I met many enthusiastic staff and volunteers, tanned by their daily exposure to the hot sun, who smile brightly while they explain the progress made protecting flocks of resting shorebirds, the nests of American Oystercatchers, and hundreds of sunbathing sea lions. It is harder work than one realizes until you see it firsthand, and understand the diplomacy and skill needed to gain support from local government, earn respect from hundreds of beach-goers, and enforce the laws that protect birds and nature for the future. On my last day, after the 18-hour overnight bus ride, we arrived at the Patagonia Co. store in Buenos Aires, for our last appointment of the trip a few hours before my international flight home. Why? To receive their confirmation of a $6,000 grant in support of our rangers in San Antonio and Rio Gallegos. I left knowing that I would work harder myself too, to make sure they had whatever they need to continue our efforts almost a world away.